After meeting at Leeds University in 2007, we’ve been best friends and travel-obsessed ever since. We always wanted to see the world, but just as important to us, was seeing it together. After 5 years, we’d saved up enough money and quit our jobs in Fashion (Sarah) and Marketing (Charlotte), struck down by now-or-never-fever! 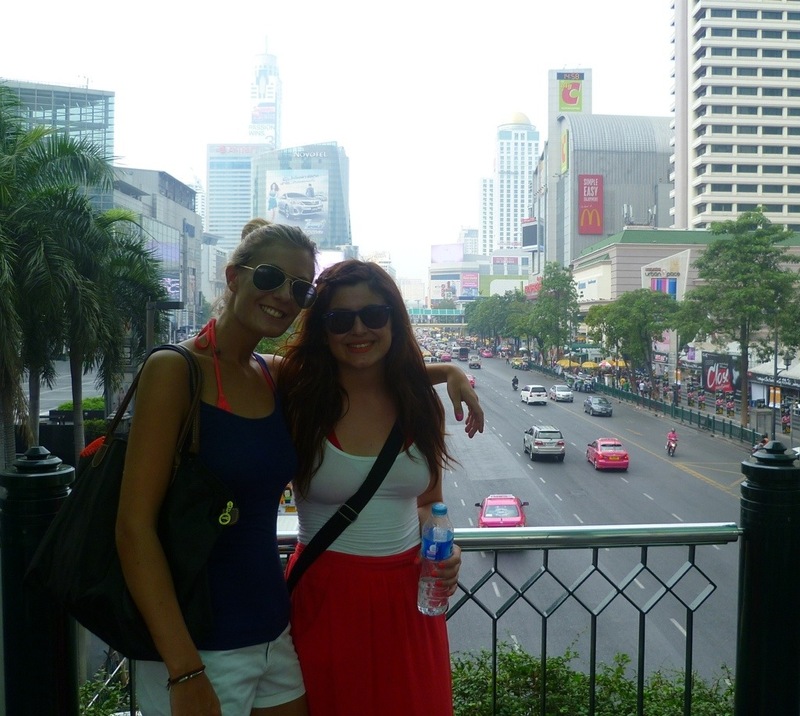 We left the UK in January 2013, aged 23, on a one way flight to Bangkok and have been all over the place since then. We rarely make plans and tend to book flights spontaneously, generally deciding upon our next destination when we feel as though we’re ready to move on (it definitely keeps things interesting!). We’re TEFL qualified and want to teach where possible, even if some quick tuition is in exchange for a night’s accommodation. We’re doing everything on a budget; the more conscientious we are with money, the longer we can keep going – seeing as much of the world as possible is our ultimate aim. Our blog is the tale of our highs and lows, our discoveries and opinions, whilst hopefully providing a few tips and entertainment for fellow backpackers and intrigued readers back home. So far there’s no looking back. Very inspiring … Wish you all the best..
Good luck girls, What a marvellous adventure. Hi Sarah and Charlotte! Thanks for the follow. 🙂 That is so brave to quit your jobs to travel, but i am sure it is well worth it. I browsed really quickly at snippets of your posts. Love what I am seeing, will have to come back later when I can read in peace. 🙂 Thanks for sharing your travels with us! Happy trekking and stay safe! You two are so adorable!! I met my best friends British Lulu & Sarah traveling around the world in 1986 –in Tahiti, New Zealand and Australia — and they remind me so much of you! We are still great friends… even after going to Africa together on an ill-construed journey in 1989 — so see? You have no idea what amazing things will come to you from this great adventure!! I wish you all happy things!!! We were in Southeast Asia (Bali, Singapore, Bangkok and Hong Kong) for only three weeks which is obviously not long enough, and found the experience most incredible. I wish the best for you two in this fantastic journey. Just stumbled across your blog, LOVE the background image and your outlook! Look forward to following your journey and wishing I was back in Asia! Thank you! It’s definitely been an adventure so far! Good luck with the trip, keep us updated on your travels! Wow there’s some awesome blogs on the list, thank you so much for including ours among them! We love your blog too, especially your post on venturing into the Cambodian wilderness – you’ve inspired us to wander off the beaten track when we visit in July! Oh that makes me so happy! Thank you and I really hope you enjoy Cambodia, it is my favourite south East Asian country! Hmm, I’m really glad you found my blog so I could in turn find yours….but I think your blog is going to make me green with envy and give me very itchy feet. Still can’t wait to live vicariously through your travels! Great blog, thanks for a couple likes on my posts, I’m following your adventures now, safe travels. Aah to be young again 🙂 Good luck with your dreams Sarah and Charlotte. I shall follow your adventures with interest. Thanks, keep up the inspiring posts too please! Hi Charlotte and Sarah, really awesome you guys get to travel around SEA for such a long time. I’m aspired to do so one day too! Thanks for following and I look forward to your adventures in your blog. Thanks Raine, we feel very very fortunate and we’re loving every minute! Singapore would be amazing, we’ll keep you posted! Great blog! And thanks for stopping by mine and liking! No worries Maddie, great blog 🙂 Thailand is fantastic, I can’t believe how much longer we’ve stayed than we planned! What an adventure you’re on! Us too. There’s nothing quite like being nomadic. I see you’re planning to stay a while in BKK at the moment. Will you try to work there? Thanks for visiting our blog, and for following. I hope you enjoy our journeys, both inner and outer. Thanks Alison. You’re right it’s definitely been an adventure so far! I quickly scanned your “headlines” and look forward to reading about your adventures! Thanks, we in turn love your travel theme posts, keep them coming!! Thanx honey, check out the rest of my blog posts. There’s some good stuff there other than themes! Thanks for liking the post on my blog. It looks like you two are going to have a fantastic trip. Best of luck. I just stopped by to say thanks for following my blog, but got caught up reading through your posts and remembering my time in the places you have been. I particularly liked seeing Patuxai in Vientiane in the sunshine, as it was pouring with rain the day I was there and I almost didn’t recognise the arch from your photos! SEA is an amazing part of the world and I’m sure you will love Australia too, although I haven’t been to Perth. Thanks so much for following my blog. I’m so excited to read more about your travels (being a travel junkie myself). Just spent a couple of hours reading all your thai adventures, will come later for more. Love your “first-time” adventures ! Never lose what you both have…simply magical. Very, very lucky and one day somewhere around the globe we may bump into each other! Thanks for your interest in my travel blog. The graphics and arrangement on your blog are beautifully put together and make it a real pleasure to view. If you ever get to Seattle, maybe you could offer a few display tips. I love your courage to simply take the risk and dive into this grand adventure! Oh if I was already grown up, I would want to be just like yall when I did. Very exciting and adventurous young women. Be safe, be happy but continue to live in the moment as you seem to be doing. I’ve been reading your blog posts and your adventures are so cool. Funnily enough I went to Uni of Leeds too (2002-2006). Obviously something about it makes you want to leave the country! Have fun, be safe and all the best. Keep on going, that’s what I’m doing! Look forward to catching up on some of your adventures! Hello Charlotte and Sarah! Thank you for dropping by and following our blog 🙂 Looking forward to following your adventures around the world :D! Good work on the blog- keep it up! I really enjoyed reading through many of your posts (can’t wait to read more!) 🙂 It’s one of the nicest travel blogs I’ve stumbled upon! I’m so glad you found my blog so that I was able to find yours in return! 🙂 You have some great stories here, looking forward to reading more.